Yet another pap recipe from the north, it’s tasty amazing and very rich. 3 cups raw kitchen groundnuts (gyadan miya in Hausa). 6 pieces of tamarind (soak in water), when it’s properly soaked soft and discard the chaff. -remove the millet chaff, add cloves, ginger, and chilli powder,now grind onto soft texture using a dry mill. -sift and discard the chaff set aside. -now remove the groundnuts bark, wash with water and grind into smooth running paste. -in a medium size pot pour in the groundnuts paste, fill up the pot with more water and allow to boil untill it foams and the water starts to dry up. NB:Remove one cup of millet flour, pour in a wooden calabash, now spray water carefully while shaking the calabash with your hands, it will make tiny balls, use your hands to shape it more. pour the balls into the boiling water, make sure it’s boiling while you pour in and keep boiling till it foams and starts to dry up. PLEASE ignore this procedure if you are not really satisfied with the explanation, this procedure must be done practical, it’s also not necessary in making kunun gyada. Below is a picture of how the balls will look like. -now using a medium size bucket, mix the tamarind liquid, with the millet powder add more water to make a running paste, stir very well and set aside. 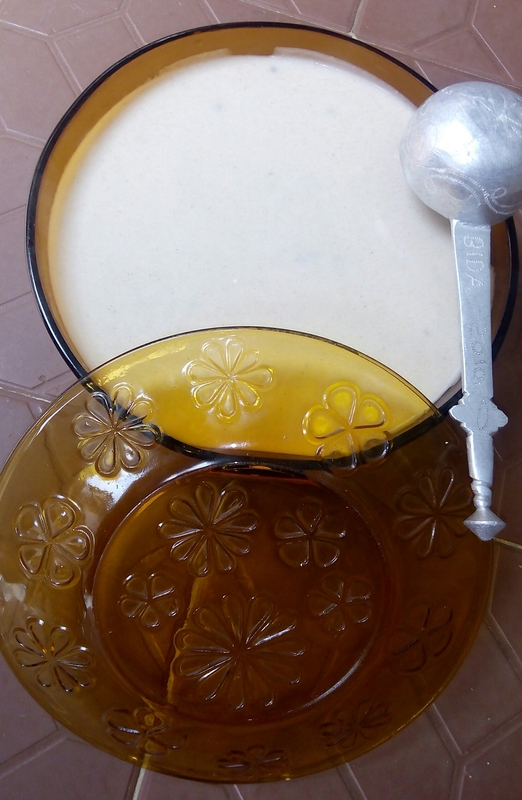 -the boiling water must be ready by now, make sure it foams and also starts to dry up a bit, pour the water into the bucket of millet powder you mixed previously with tamarind, allow to stand for while and stir properly of it feels to thick add little tamarind liquid or water, add sugar and serve. 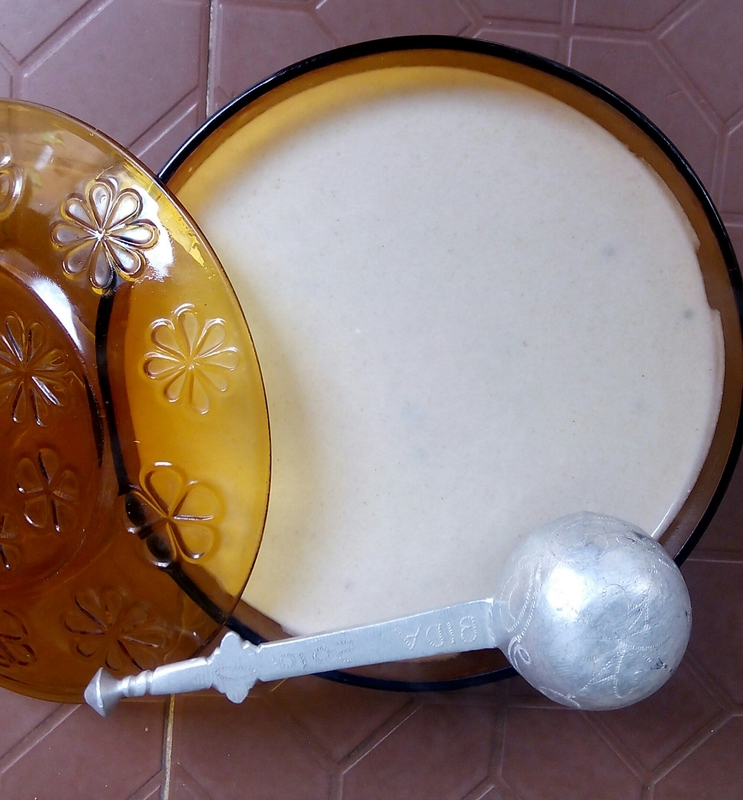 This is a northern snack used for taking fura da nono,its a local recipe and i went all the way to bring it here,ever wondered how fura da nono gets to your table? the answer is here. utensils needed are mortar and pestil/blender/grinder. N:B but for this recipe am using mortar and pestle. pour the millet grains inside the mortar,add half cup of water and pound using the pestle untill the chaff comes off (this procedure is same as removing beans coat so alternatively use a blender). pour the seeds in a tray and allow to dry under the sun for 15mins. after 15mins dust off the chaff(process of moving the tray up and down to breeze of the chaff). discard chaff,wash grains to remove sand particles,drain and put under the sun again to dry for another 15mins. after 15mins pour back the grains into the mortar,add ginger powder and pound/blend/grind untill you achieve finely smooth powder. sift the powder using a siever with tiny holes and discard the chaff. at this stage you would have achieved a smooth millet powder and its time for cooking. boil water and scoop the powder in balls using your hands and press against your palms,drop this balls into the pot of boiling water one at a time. keep scooping and dropping the balls, close and allow to cook on high heat for 30mins. 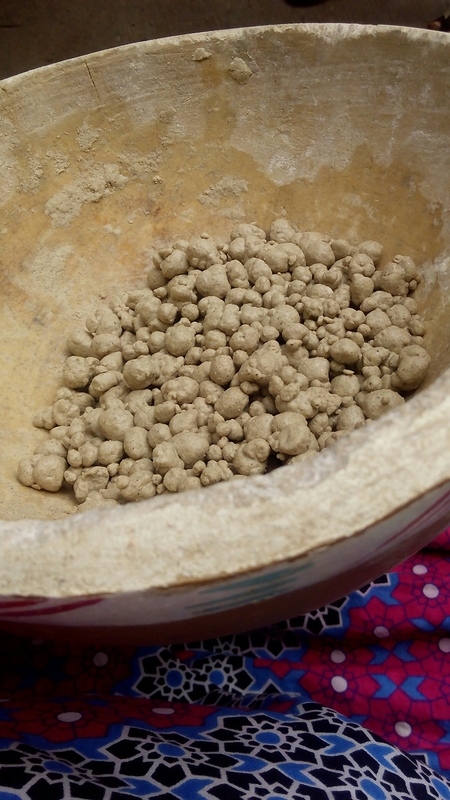 after 30mins it will feel hard,drain and pour back into the mortar,add small amount of the water residue used in the cooking the millet balls and pound . you will notice how dense it will become. keep some powdered millet aside for dusting. now using your hands start scooping again from the mortar and make round small balls out of the dough. always dust your hands with some powdered millet while making balls to prevent the dough from sticking to your hands. make smooth round balls . now dust some millet powder around the fura balls.